So you’re finally taking steps to make that outdoor deck a reality. It’s been lingering in the back of your mind for years now, but other projects and circumstances have prevented you from actually having it built. This is going to be the year. It’s going to beautify your home’s exterior, give you more square footage to work with, and provide new options for entertaining and outdoor cooking. But there are decisions to make—not the least of which is what kind of material to use. You have traditional lumber such as Redwood or Cedar. You have pressure-treated lumber of all kinds. And you have various composite materials that blend organic materials with plastics and polymers to make a more age-resistant surface. In this post, we’re going to look at the merits and benefits of using pressure-teated lumber for your forthcoming deck (or deck resurfacing) project. Every material has its advantages, and pressure-treated lumber is no different. Only a few types of natural lumber have the insect- and weather-resistant properties needed to construct an outdoor deck. Redwood and Cedar are the two most common. But even these types of lumber will eventually rot and decay. A special pressure-treatment process can circumvent this problem by infusing virtually any type of natural wood with anti-insect and anti-aging properties that surpass those of untreated Redwood, Cedar, or other woods traditionally used in outdoor decks. Specifically, the wood goes inside a special cylinder or tank that is depressurized—that is, all the air and atmosphere is sucked out of the tank. A special preservative is then pumped into the depressurized tank, which allows it to penetrate and deeply infuse the wood. The EPA has approved several chemicals for use in pressure-treated lumber, but the most commonly used for residential purposes is alkaline copper quaternary (ACQ). The pressure-treatment process allows powerful preservatives—with anti fungal and anti-insect properties—to penetrate deeply into the grains and fibers of the wood. This is different from sealing and coating, as it results in protection from the inside out. 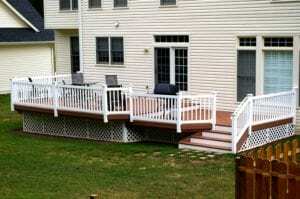 In many cases, outdoor decks constructed with PT lumber will last 15-20 years if properly maintained. This rivals the lifespan of decks made with ultra-modern composite materials. One of the drawbacks of using an exotic tropical hardwood or a modern composite material is cost. These materials may stretch your project budget beyond what’s possible. PT lumber is comparatively affordable. The fact that virtually any type of lumber can be pressure-treated means that many suitable varieties are available. And at an average cost of $15-20 per square foot installed, PT lumber often represents a cost savings of around 50% when compared to high-end composites or Cedar. Among the common complaints people commonly have about composite materials is the appearance. While high-quality composite materials closely mimic natural wood, other varieties make it easy to tell the difference. Many homeowners love PT lumber because it retains an attractive, natural appearance despite the rigorous strengthening that comes from the pressure-treatment process. When it comes to finally making your outdoor deck a reality, you want to make sure it’s done right. Choosing the right material for you, as well as a qualified outdoor deck specialist to fashion that material into your dream deck, is vitally important to the success of your project. There are definite advantages to using PT lumber for your project, and knowing about these benefits will help you make an informed decision.